Howdy programmers, it’s Andy Gesner and the HIP Video promo crew here to bring you one of the most interesting and passionate artists you will probably have the pleasure of hearing and seeing this year. Charles Bradley is a raw and wild talent that has to be heard and whose story must be understood in order to be fully appreciated. “The World (Is Going Up In Flames)” is a showcase of gorgeous and raw vocal power on a sea of timeless melody and endless soul. Bradley’s voice reflects the many trials and tribulations his vagrant and roving life has sent his way. Charles was raised in Brooklyn, New York, and spent the better part of his childhood living on the streets. However, by a chance ticket to see James Brown in concert at The Apollo in 1964, his destiny was forever moved and he promptly began perfecting his moves at home with a broom-turned-microphone. He then spent many years of his life trying to make ends meet by traveling as a chef, working jobs from Maine to Alaska, while always keeping his dream of music alive by performing at night. Bradley has seen the country and felt its biting cold trials as he was constantly forced to move and search for work. Since he could not afford a vehicle until later in his life, he often hitchhiked, facing the dangers of the road (including one driver who confided in him that he had just killed his wife and children). Eventually fate brought him back home to Brooklyn, where he was discovered by Daptone Records mastermind Gabriel Roth. The rest is in your hands. “The World (Is Going Up In Flames)” is both classic ‘60s soul and a product of the times, all in the same package. 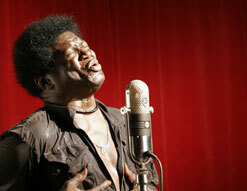 Thanks to modern studio reach, we are able to hear Charles Bradley’s rich voice with the utmost precision. And, what a voice it is! The 62 year-old soul singer is sprite with energy beyond many of his younger contemporaries and has more experience and passion than most will ever glimpse during their lives. The “The World (Is Going Up In Flames)” music video features Charles as he traverses rooftops, backdrops, and subway stops of his beloved hometown of Brooklyn, New York. With every frame it is easier to see why, after all these difficult years, this man could never give up his dream – because he was born to sing for us. This month, Charles Bradley has been on the road, supporting his label mates Sharon Jones & The Dap-Kings. In February, he will cross the pond for a European tour with Menahan Street Band and Lee Fields and the Expressions. Then, he will continue touring in April with The Budos Band and build up to a headlining run. Needless to say, Bradley’s got a busy year ahead of him and is taking it head on! “The World (Is Going Up In Flames)” is the leading single from his brand new record No Time For Dreaming, which has just hit stores in late January. The album has already attained critical and press attention, including a feature on IFC.com. We are completely awed by Charles Bradley, both in story and in talent. It is our greatest honor to help break out this latest Daptone Records persona, and we hope you will join in. If you need more info, call Andy Gesner at 732-613-1779 or e-mail us at HIPVideo@aol.com. You can also visit www.DaptoneRecords.com or www.TheCharlesBradley.com to find out more about Charles Bradley.